improve performance by optimizing design and printing parameters. Additive Manufacturing (AM) has been successfully applied using both metals and plastics in the aerospace, automotive, bio-medical, tooling, and other applications. 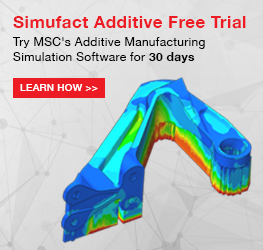 MSC's solution for Metal Additive Manufacturing – Simufact Additive – puts its focus on build simulation and subsequent steps including heat treatment, cutting the base plate, removing supports, and Hot Isostatic Pressing (HIP). The process simulation solution addresses both manufacturers and researchers and their needs. Simufact Additive is the leading simulation package for metal build process optimization concerning speed, accuracy, functionality, and usability. The software comes with a workflow-oriented user interface, which customers report as the best-in-class GUI. Simufact Additive is ready for High Performance Computing based on Linux clusters. Will it be accurately printed? Will it fail? Will it warp? What is the best building orientation? What is the expected material behavior and mechanical performance? How anisotropic? From raw material to the finished part, capture all manufacturing inputs, both virtual and physical. Virtually and quickly search across thousands of machine and process parameters in order to find desired optimal properties. Leverage comparison tools, such as material compare and cross plot, in order to optimize machine and process parameters to product consistent and reliable components. MSC's vision for the future is to provide a complete AM toolkit that helps companies to optimize their entire AM process chain - including CAE, selection of raw material, manufacturing, and quality assurance. Some of the challenges that currently exist in this space include ill-defined and poorly tracked process parameters, which leads to engineers running several print jobs against several parameters. This in turn leads to longer process development time, high amounts of material waste, and time wasted on printing parts that are unfit for service.